Estimated 2019 opening? April 19th!!! FIND US ON FACEBOOK AND TWITTER FOR UPDATES, GOLF SPECIALS AND PRO SHOP SALES! 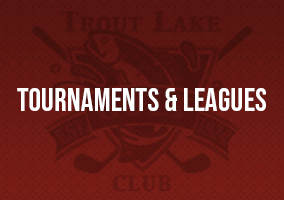 Established in 1924, Trout Lake Golf Club, is the oldest 18-hole golf facility in the Northwoods. After the completion of the back nine in 1926, Trout Lake Golf Club has become a premier golfing destination in the Northwoods and has been enjoyed by the thousands. The clubhouse is the original 1880’s logging home, and was recently remodeled with extensive work on the fireplace, golf shop and the historic screened porch overlooking the 18th fairway. Trout Lake Golf Club is also the home of the Devils 5K Sunset Trail Run. Click here for more info!